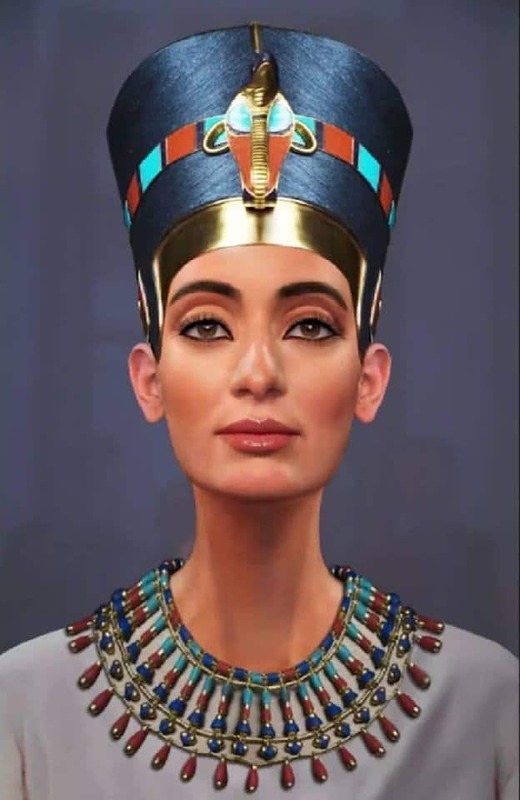 Home / What is really known about Egyptian queen Nefertiti? Hardly a figure like Egyptian queen Nefertiti could go unnoticed. And that, finished the episode of Amarna, in which her husband, Akhenaten, imposed a new religious cult, the Egyptians themselves tried to banish the memory of the heretic pharaoh and his sublime beauty wife. Up to us have come reliefs and sculptures that have provided the most beautiful profile of the queen. Such a face could only belong to a woman out of the ordinary. She was awarded an overwhelming life and personality, more typical of myth than of history. Egyptian queen Nefertiti was the right hand of Amenhotep IV (later called Akhenaten, c.1350-c. 1333 BC) in the implementation of the one god only, Aten, or the sun disc. The genius of its creators resided in the absolute dominance of propaganda and the ability to materialize the project in powerful images. The message was effective, and in a few years scenes of the daily life of the royal family were exhibited throughout Egypt offering the living stamp of happiness. But, aside from this artificial world of gestures, very little is reported to us of the real Nefertiti. 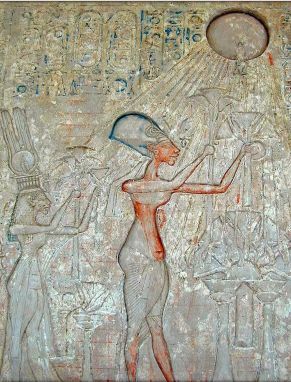 Akhenaten and Nefertiti walk with their hands linked. Photo: Wikimedia Commons / Rama / CC BY-SA 2.0. fr. 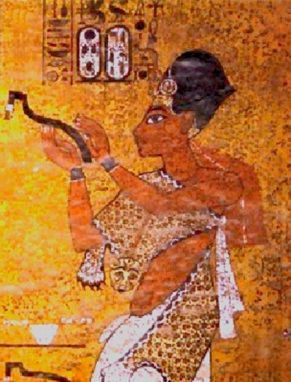 Her first representations date back at least to year 4 of the reign of Akhenaten, when the couple still lived in Thebes. 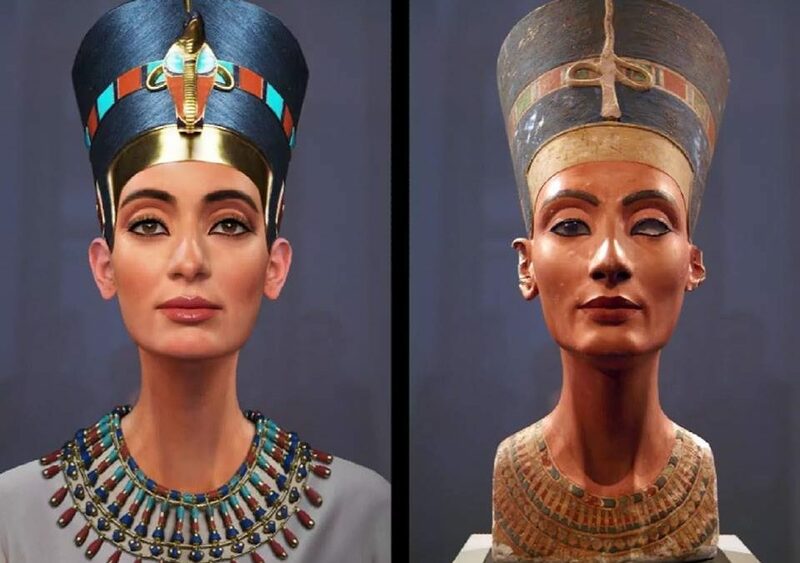 Nefertiti appears next to the pharaoh in quality of great royal wife during the celebration of the cults. There the person ended and the character began. In fact, we do not even know her real name, because Nefertiti’s, “the beautiful one has come,” acquired it precisely when she became queen. Little is known about Nefertiti’s origins: her true name and that of her parents are not known with certainty. And although we do not know the name of her parents, most likely their origin was Egyptian, and not Asian, as some authors have proposed. Archeology only gives us another name more of her family environment that of her sister Beneretmut, whom we see in the reliefs enjoy the pleasures of the court. Egyptologists have many difficulties in rebuilding the first years of their reign. At the death of Akhenaten, his buildings in Thebes were dismantled, although fortunately the immediate successors reused the blocks as filling material, with which revealing inscriptions were preserved. In year5 of his reign the pharaoh founded the city of Akhetaten, “Horizon of Aten.” (Today Tell el-Amarna), and the court left the traditional capital of the god Amun. 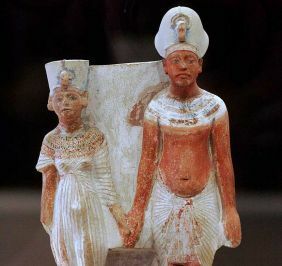 The royal couple was placed under the protection of Aten, and this radical step was marked with a name change: Nefertiti was called Neferneferuatón, “beauty is the perfection of Aten”, and Amenhotep (“Amun is happy”) chose that of Akhenaten, “the one who satisfies Aten”, thus synthesizing his new political-religious program. The religious revolution imposed a new iconography that showed the private life of the royal couple. The gestures of affection multiplied. 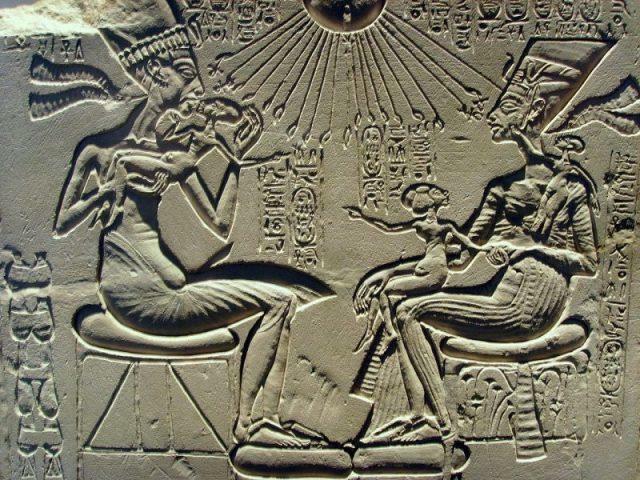 In the reliefs we can see Nefertiti sitting on the legs of Akhenaten while playing with their daughters, or hugging and giving each other a warm kiss. In the sculptures, the spouses walk together with their hands entwined. They are details that made the queen the exemplary wife. But this infinite love, despite the captivating images, does not inform us about real feelings. In Akhetaten they lived in a great fortified palace separated from the rest of the city. Nefertiti’s access to the image was unheard of. For the first time, the representations of a queen were omnipresent in public spaces, but appeared even in private ones, as in the tombs of officials. The taste moved to stylized bodies of short torso, broad hips, broad thighs and bulging belly. The faces were characterized by slanted eyes, marked cheekbones, prominent chin and full lips. The necks were excessively long, and the skull artificially elongated. Sometimes, the images of Akhenaten are confused with those of Nefertiti, with the same affectionate and exuberant profile, in a desire to present themselves as twin entities. In fact, male figures in general adopted more languid forms, dressed in elaborate dresses more typical of women’s fashion. We will never know how much the queen actually approached this ideal of beauty. The artists had to create images that represented this ideal archetype, leaving no room for the defects of time. Therefore, the famous polychrome bust of Nefertiti perfectly synthesizes this exemplary character. 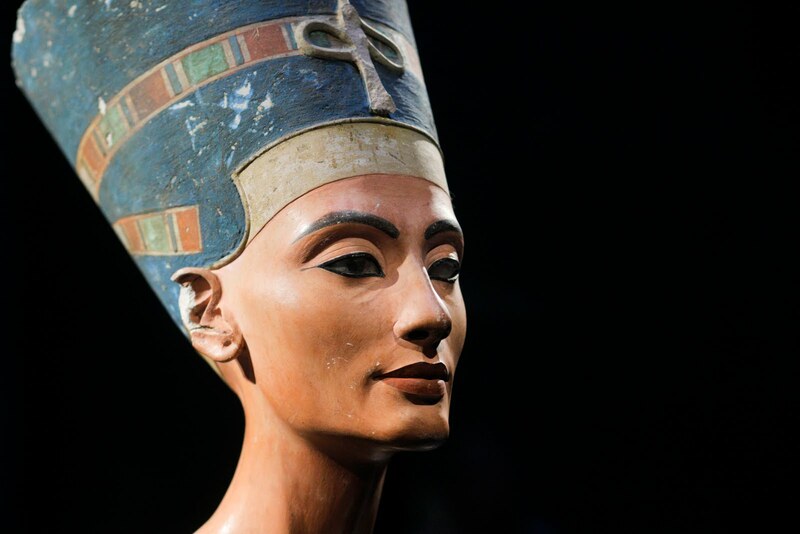 In fact, the choice of the name Nefertiti, on the other hand quite common among women, was not accidental. “Beauty has come” evoked the myth of the goddess Hathor, excellence feminine principle. In the daily life of the court was also an influence. Among the headdresses, she preferred the high crown blue. Apart from occasionally Tiye, no queen had used it before. From the moment of their marriage, the pregnancies happened, after which she gave birth to six daughters. The first, Meritaten, was born around year 5 of the reign. A second daughter, Meketaten, was born only one year later, very much followed by Ankhesenpaaten, the future wife of Tutankhamun. Between years 8 and 11, Neferneferuaten Tasherit, Neferneferure and Setepenre arrived. These princesses, recognizable by the typical lateral braid of childhood, were incorporated into the iconography shortly after their birth. Not only did they appear together with their parents in the cults, but also in the scenes of daily life. More than ever, art focuses on the idyllic aspects of a world seen only under the prism of the royal family. However, the first time we see Nefertiti without that superhuman aura is the loss of three of her daughters. After year 12 the death of the small Neferneferure and Setepenre took place, which were buried in a room of the royal tomb (TA 26) excavated in the cliffs that surrounded city of Akhetaten. A little later, when she was barely eight years old, Meketaten died, to whom she reserved a room close to that of her sisters. For the first time in Egypt, the pain of the royal family was expressed. Very shortly after, it was Neferneferuaten Tasherit’s turn. Only Meritaten and Ankhesenpaaten survived. The only thing that Nefertiti lacked was a son. It seems that the arrival of an heir was made to wait. That Nefertiti was an essential part of the success of the Akhenaten reform is clearly seen by its exceptional power. However, we must not forget that he benefited from a promotion of female royalty that goes back several generations, with figures such as Hatshepsut or even Tiye herself. In the case of Nefertiti, it is evident to what extent she dared to borrow images from Akhenaten. Not only does she accompany Akhenaten when he sets out to beat the enemies, in one of the best-known symbolic representations of pharaonic Egypt, but she alone holds the weapon in an executor gesture. Egyptologists try to reconstruct the last years of the Egyptian queen, from whom neither her grave nor any object of her funeral material has been found.